Finlandia Pre-Fab Saunas – Build Your Steam Bath in One Day! The invention of pre-fab saunas has opened up the home craze to a legion of new enthusiasts. What was once thought of as an unaffordable and unobtainable luxury has become easy to install and available to everyone. But what are prefabricated models? 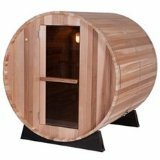 They are complete, ready-to-build, free-standing sauna rooms that can be put anywhere in your house that has open space. Finlandia pre-fab saunas come in sizes from 4'x 4' to 8'x12' and anywhere in between in ½ ft. increments, and with different layouts depending on the placement of doors and the sauna heater, and for the benches in the larger prefabricated units. Clear Western Red Cedar wood is standard for the interior (and optional for the exterior walls), but the company also allows you the option to choose from clear Redwood, clear Alaskan Yellow Cedar, and clear Western Hemlock. 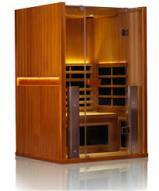 The high quality home sauna kits have panels that are interlocking and insulated, and the door seals tight. Prefabricated home saunas from Finlandia use tongue and groove locking panels comprised of layers of Douglas Fir plywood exterior (standard); 3 1/2” fiberglass insulation; type C foil vapor barrier; and 3/4” kiln-dried Cedar interior wood. The Mahogany plywood exterior is designed and finished so elegantly that all of the cabinets have that custom-built look. Or again, you can opt for the Cedar exterior if you so choose. Here are some other options that can be ordered with pre-fabricated saunas: exterior wall control, cedar vents, positive etched glass door, and 12" X 60" sidelight window. Finlandia sauna heaters come with built-in controls complete with a 60-minute timer, 1 to 8 hr. pre-set programmable timer. 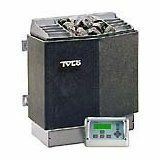 Front or side-mounted controls and comes in a beautiful stainless steel finish and a large rock tray capacity. 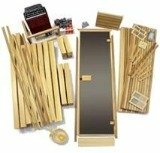 Prefabricated saunas require a wooden bucket with plastic liner, ladle, thermometer, and bathing sign - these are all included with the kit. Pre-fabricated saunas can be built in a few hours, whereas a pre-cut sauna kit can take a few days. For example, a 4'x 6' Finlandia Sauna requires only two people to set up following easy step-by-step instructions. This is a 3-person sauna in a standard 72” wide (exterior measurement) room design with two benches, upper and lower. Best of all, the Finlandia pre-fab saunas are affordable to operate, costing as little as $3 per month to operate (3 x per week with one hour sessions).